I've had this post on hold for a couple weeks now. The cookies have been gone for a while and I just couldn't get around to finish it. No particular reason. Just so. Then I completed the recipe yesterday evening but couldn't find inspiration to say a few words before it. It was just one of those days when I wish I could be alone and not bother with whiny kids who want to eat candies instead of their lunch and go play instead of eating dinner. Sometimes I wonder how my 3-year old manages to survive a day eating nothing but a cup of milk, a tablespoon of cereals and maybe a yogurt, a piece of apple (everything but milk is optional). And she never stops moving. It takes so much patience to handle her, and I'm not up to it every day. Years ago, when I was a third year student at the university, I started teaching English to kids. My first job was in kindergarten and I still remember my first class so vividly. Especially a couple kids from this group. I remember one of them because he tried in every way to ruin my classes responding to every question I asked with "f" words. A 6-year-old certainly doesn't understand fully the meaning of those words, but most certainly copied his father's language (that's what his teachers told me, and when I told his mother about it, he was totally ashamed, hiding behind her, but continued in the same way the following lesson). The other kid was the cutest little man you could imagine. He was only 4 years old, the youngest of the group. He refused to speak or play or sing with other kids and I wondered why his parents insisted on sending him to English class when it seemed like he had problems speaking his own language in the first place. Whatever we did he sat apart with his back towards us, or under the table while we were having a drawing activity. And he kept repeating (in Croatian) "I'm angry. I'm angry with everyone." And then one day, I talked to his grandfather when he came to pick him up after the class. And you know what he told me? "Ivan loves English so much, at home he sings the songs you taught him all the time." I don't know if you can imagine the surprise on my face and the happiness that filled me in that moment. "He sang in English at home? He never said a word in English all year round, not in front me!" Apparently, things are not always what they seem to be. My daughter doesn't seem to be hungry. I guess I just need to find a way to prove the opposite to her. My days seem either endless or too short and I seem to be doing always the same things. I need to find a way to show myself it is not so. "I'm not angry with anyone." I need a bit more space for myself, but I need to create it myself. And, although it bothers my husband from time to time that I spend my free time blogging, this is my little space, my window through which the world seems a bit different and yet so similar to mine. After all, every cloud has a silver lining. And until I find better mood and energy to face a new day, a nice, sunny cookie and a glass of milk could help, don't you think? More so if you find a little time to bake it yourself and to share it with a friend. 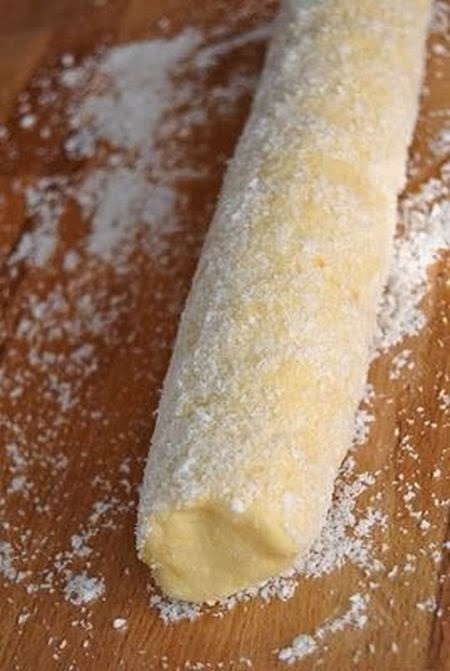 Mix the butter and the cream cheese with an electric mixer for 1 minute. Add the powdered sugar and the baking soda and continue mixing until creamy. 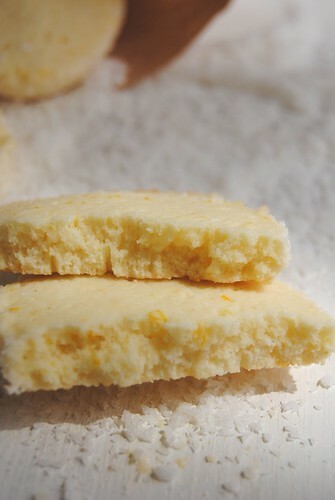 Add the egg, the finely grated orange zest, the orange juice and the vanilla extract – mix shortly again. Stir in the flour, drop the dough on a floured kneading board, and knead shortly to form smooth dough (if necessary, in case the dough is sticky, add a bit more flour, but not too much). Divide the dough in two parts and form two 20 cm long (about 5 cm in diameter) logs. Roll the logs in the coconut flakes and then wrap each in a piece of plastic wrap and chill in the fridge for 1/2 an hour (to 1 hour, I put the logs in the freezer in the end, for 10 minutes, because they were still too soft to cut). Turn your oven on to 190°C. 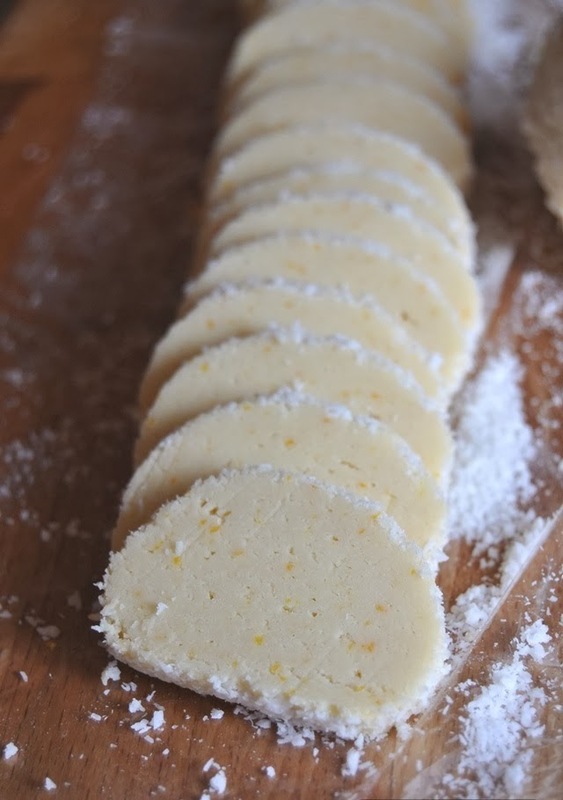 Slice the dough into 5 mm thick slices and place them on baking sheet. Bake the cookies for 8-10 minutes, they should stay pale. L’unica differenza rispetto la ricetta originale e la quantità maggiore di farina (esattamente 100 g in più). Hanno un aspetto così delicato (per una volta sono riuscita a non bruciare neanche un biscotto) e il sapore che vi coccola nelle giornate grigie quando il sole è solo un ricordo lontano. Cosa vi manca? Un bicchiere di latte… E va bene, un bi’cotto anche a voi (ve lo offre Sara). Lavorate il burro e il formaggio con uno sbattitore elettrico per 1 minuto. Unite lo zucchero a velo, un pizzico di sale e il bicarbonato. Aggiungete l’uovo, la scorza, il succo e la vaniglia e mescolate brevemente. Alla fine incorporate anche la farina e formate una pasta morbida. Lavoratela sulla superficie infarinata finché diventi liscia. Dividetela in due parti e formate due rotoli lunghi 20 cm (di diametro circa 5 cm) e passateli nel cocco. Avvolgete i due rotoli nella pellicola a lasciateli rassodare in frigo per circa un’ora. Se la pasta è ancora troppo morbida per tagliarla, mettetela 10 minuti nel freezer. Tagliate i rotoli a fettine dello spessore di 5 mm e adagiatele sulle piastre rivestite con la carta da forno. Cuocete i biscotti per 8-10 minuti, lasciateli intiepidire sulla piastra e poi trasferiteli su una griglia. Ovi bljedoliki, mirisni keksići osvojili su me od trenutka kad sam pročitala sastojke i nisam se razočarala ni nakon što sam ih napravila - jedva sam čekala zagristi ih još onako tople i topljive. Maslac i sir sobne temperature mutite mikserom 1 minutu. Dodajte šećer u prahu i sodu bikarbonu pa dalje miksajte da postane kremasto. Dodajte jaje, sitno naribanu narančinu koricu, sok i ekstrakt vanilije pa kratko izmiješajte. Umiješajte brašno (drvenom kuhačom), istresite na malo pobrašnjenu površinu pa kratko mijesite da dobijete glatko tijesto (ako vam je premekano i ljepljivo dodajte još malo brašna). Podijelite tijesto na dva dijela i od svakog oblikujte rolnicu dužine 20 cm. Rasporedite kokosovo brašno na dva komada prozirne folije pa urolajte rolnice od tijesta u kokos, omotajte ih folijom i ostavite u hladnjak na 1/2 sata do sat. Zagrijte pećnicu na 190°C. Obložite pleh papirom za pečenje. Rolnice izrežite na ploškice debljine 5 mm i stavljajte malo razmaknute na pleh (ja sam tijesto stavila 10 minuta u zamrzivač pa se lakše rezalo, ali onda ga ne treba odmah staviti peći već ostaviti izrezane ploškice 10-15 minuta na sobnoj temperaturi). Pecite kekse 8-10 minuta, pazite da ostanu svijetli. Anche io faccio dei biscotti simili con il Philadelphia, sono buonissimi. Vidjela sam i ja ove keksiće na Coolki i tamo su me oduševili a ovdje su me opet oduševili :). Krasnih sastojaka i lijepo izgleda, ...., baš za dozvati bolje vrijeme i raspoloženje ! sono stupendi... devono essere anche troppo buoni! 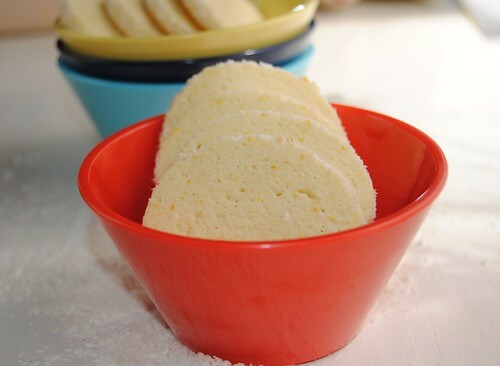 I adore cookies made with cheese...but haven't tried baking some with cream cheese. Prekrasni su kolačići, sastojci su odlični. Ne znam kako si mogla izdržati sa mališanima i kako si uspjevala održati njihovu pažnju. Uvijek se divim tim ženama. Divni su, tako savrseno svijetli. 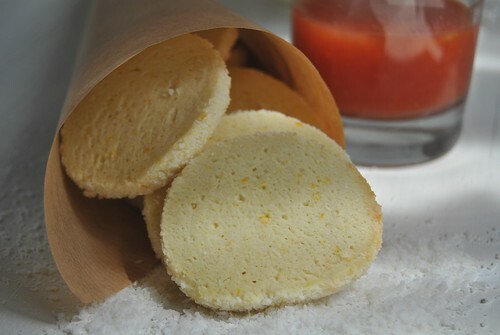 Meni se obicno takvi shortbreads obicno 'razliju' pri pecenju :(, probat cu tvoj recept! Il formaggio cremoso, potrebbe essere il philadelphia? Belli , danno davvero l'impressione di essere delicati e leggeri!!!! non ho mai provato i biscotti così come li hai fatti tu, letti, anche in libri ma mai sperimentato! wow this is really delicious cookies..i like the orange flavoured cookies n muffins .for better mood have this cookie..
Could you please give the measurements in Cups instead of grams? That would help me alot..thanks! I'll try, but I don't know how precise that will be, it's so much easier to use weight measures instead of volume. At least that's always my problem when using a recipe where measurements are expressed in cups, things never turn out right for me. could you publish the recipe in cups, rather than grams? Sorry, but volume measures are just not my first choice. It would take too much time for me to measure and convert into cups. Besides the fact that you cannot reach the same level of precision. Kitchen scale doesn't bite, trust me, even my 6 and 9 year old daughters know how to use it. I wish the other recipes were in english. 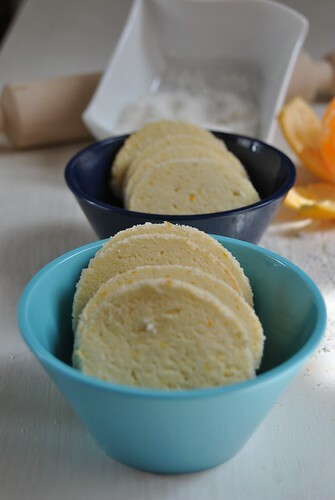 Dajana, I love your blog, beautiful pictures with the recipes. A scale can be had for around $12.00 to $15.00 at Target and is a worthwhile investment for any baker, if not the weight to cups ratio can be googled, you have done enough with the Blog in it self. 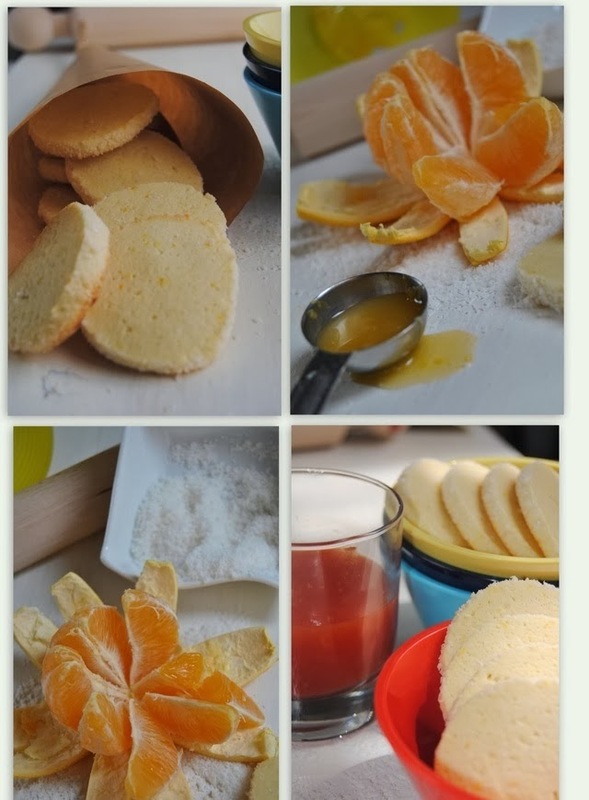 I will try this recipe and many more that I have looked at on your blog. I will come back many more times. Thank you for taking the time to bring us all these wonderful recipes. Thanks a lot for visiting. Hope you like the cookies and all other recipes you decide to try.